BIS Hallmarked 92.5 purity sterling silver Ring is artistically made according to the astrological needs. Gemstone is left open from the back side for rays to pass through and reach finger properly. High quality making in our own state-of-the-art manufacturing unit gives this ring a beautiful look. Gemstone certified by a govt recognised laboratory. Sterling Silver hallmarked by BIS. We use only Natural Gemstones qualified for astrological use. And this ring is made up of pure 92.5 % hallmarked silver. For any doubts regarding naturality or metal type please contact us. Ring sizes are mentioned as per USA ring size standards. Please double check your ring size with a jeweller before ordering. 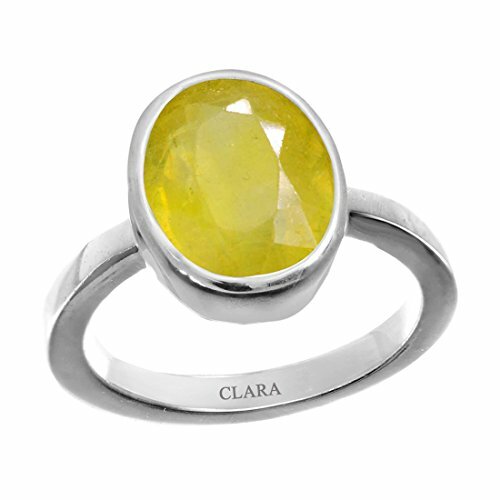 Stone weight is mentioned both in carat and ratti. Ratti calculated as per 180 milligrams for 1 carat. If you have any questions about this product by Clara, contact us by completing and submitting the form below. If you are looking for a specif part number, please include it with your message.